DinoDirect was founded in 2007 and is a place where people go to buy items directly from China. While this site at times resembles other Chinese marketplaces such as Aliexpress or Dhgate (for example), DinoDirect appears to sell most of the merchandise themselves. So if I had to compare this site to an American site, I'd likely compare it to Amazon before I'd compare to eBay. 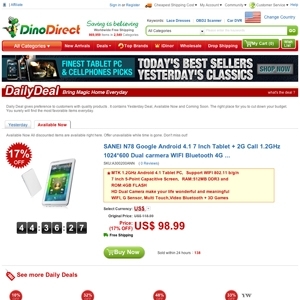 As for the deals, DinoDirect offers many types of deals and the DinoDirect daily deals are amongst them. Interestingly enough, DinoDirect provides customers with a way to "vote" on yesterday's deals (those that have expired) via a "I want one" button; items with the most votes have a better chance of going on sale again in the future. Dinodirect.com currently ranks #16 amongst sites offering online deals -- MiniInTheBox ranks #15. In the General Merchandise category, DinoDirect ranks at #12 -- Deals.miniinthebox.com again ranks slightly higher at #11.